In the olden days of travel, inflight entertainment options were pretty slim. Most airlines had a central screen that played movies, edited for content, and had audio channels that offered different genres of music. And you could listen to all of this while wearing uncomfortable, tube-like headphones that wouldn’t win any awards for sound quality. If you were bored, you could read magazines, newspapers or your own books. Fast forward to today, where, depending on the airline, passengers have hundreds of hours of options, including Wi-Fi, movies and television shows, games and music. Some of it is built into an airline’s fleet, and some have options where you can bring your own devices and access in-flight entertainment options. Skytrax released its list of the World’s Best Airlines in 2017, and one of the categories was the World's Best Inflight Entertainment. Below we review the in-flight entertainment options on the top 10 winners in this category. Dubai’s flag carrier was number four on Skytrax’s list of best airlines, but it was number one for in-flight entertainment based on its Ice system. Emirates does not want you to be bored on its long-haul flights, so it offers more than 2,500 channels of movies, TV shows, music, and games, all on demand and in multiple languages. Ice’s digital widescreen even offers movies with audio description and closed captions for those who are hearing or visually impaired. There’s a dedicated channel for eSports enthusiasts and the chance to brush up on your language skills with uTalk videos featuring Arabic, French, German, Italian, or Spanish lessons. And it offers limited free Wi-Fi on its long-haul flights. This Doha-based airline topped Skytrax’s list of the world’s best airlines, but its Oryx One inflight entertainment system came in second place. The system offers travelers more than 3,000 viewing and listening options. Under movies, the airline offers the usual Hollywood fare but goes a step further with options for Arabic, Bollywood, Asian, Indian and European films. Television show options include documentaries, European, Asia, Hindi, Urdu, TED Talks and sports. Audio options include thousands of hours of music and talk in every genre, and games ranging from checkers to casino games. It also offers Wi-Fi on its fleet of Airbus A380s, A350s and A319s, along with its Boeing 787s and select A320, A321, and A330-200 fleet. This airline, long considered a leader in in-flight entertainment, is number two on the list for world’s best airlines and its KrisWorld system is number three on this list. The system boasts more than 1,000 movies, television shows, music and games designed to keep passengers happy and entertained on its long-haul flights. It offers a mix of movies, television shows and music from around the globe. There are traditional and modern games for every age. And Singapore Air offers in-flight Wi-Fi on its fleet of A380s, A350s and Boeing 777-300ERs. The airline’s digital Planet entertainment system — Information, Entertainment and Communications — is in place on select routes on its A330, A340, B777 and A321 fleet. Entertainment showcases classic, feature, international and kid’s films, a channel with short films and music options ranging from Pop and Rock to Traditional Turkish Folk. The airline also has a game channel for single or multiple players. Under Communications, passengers can send and receive SMS/email, receive weather reports every four hours and news updates every hour. The Information section covers the airlines’ fleet, cargo, frequent flyer program, destinations guide, airport and flight maps and flight cameras that allow passengers to watch takeoffs and landings. In 1991, this The London-based carrier became the first to unveil individual seat-back televisions offering entertainment choices in all of its cabin classes. The Vera in-flight entertainment system offers a mix of Hollywood and world films, tv shows and series that can be binge-watched, a dedicated channel for children, hundreds of hours of music in broad genres and games ranging from Battleship to Who Wants to Be a Millionaire. The airline offers Wi-Fi on its fleet of A330, A340, 747 and 787 jets. The German flag carrier offers more than 100 films movies in up to eight languages, more than 200 television shows and a large selection of movies, TV, audio books and music that targets families and children. If you have the urge to binge watch, the airline offers whole seasons of TV series. In music, the airline has more than 50 playlists across different genres, along with 60 audio books in German and English. It also offers Wi-Fi access via its FlyNet service. Australia’s flag carrier offers comprehensive in-flight entertainment on its long-haul flights, including new release movies, TV programs, and an extensive CD library. On its A380, A330 and selected Boeing 747s, travelers have more than 1500 entertainment options, with more than 100 movies, 500 TV programs, 800 music options, 18 radio channels and daily Sky News coverage. There’s also a dedicated kids channel with programming and games. On select 747 and A330 flights, there are 500 entertainment options, including up to 60 movies, more than 250 TV programs, 250 music options, 18 radio programs and a large selection of games. Read nearly 4,000 magazines and newspapers from around the world on the Qantas app powered by PressReader, the world's largest newspaper and magazine platform. PressReader offers passengers a free 12-hour download period to download issues direct onto a smartphone or tablet via iTunes and Google Play. The airline is installing fast and free in-flight Wi-Fi on its domestic flights that will be complete by the end of 2017. The Abu Dhabi-based airline was number eight on the Skytrax best airline list and six for in-flight entertainment. It uses its E-Box system to offer global movies, blockbuster and classic films, a large selection of television programming, including the ability to create video playlists, all with multiple language tracks and subtitles. On select flights, there’s also live news and sporting events. Under audio, passengers have access to more than 500 CDs in the music library where they can create personal playlists. The system also offers access to more than 60 Android-based games. The airline also offers Wi-Fi access on select aircraft. The Atlanta-based carrier claims it was the first U.S. airline to offer all inflight entertainment for free. Under its Delta Studio product, travelers can indulge in more than 1,000 hours of entertainment, either on their tablet or smartphone or via the seatback screen for movies, television and music. Passengers need to download the Gogo Entertainment App (via iTunes or Google Play) in order to get Delta Studio programming. Delta also uses Gogo to provide in-flight Wi-Fi access on its two-cabin aircraft and all of its wide body, long-haul jets. 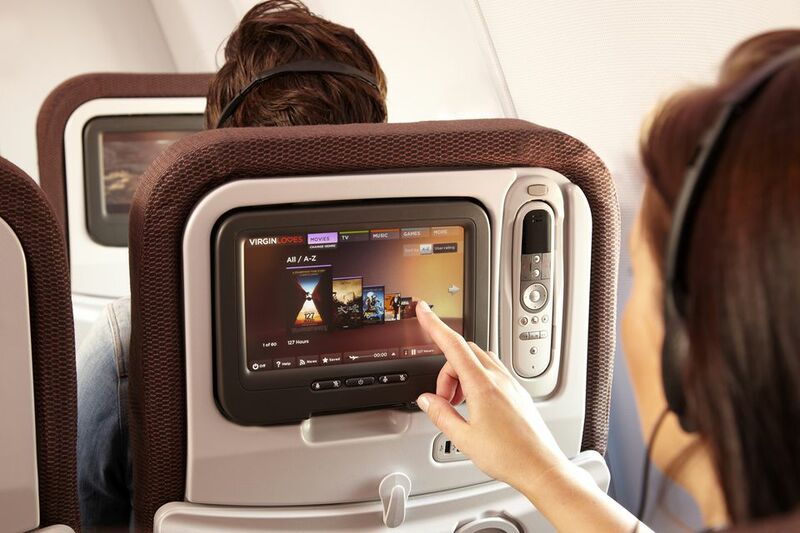 The airline offers more than 1,000 hours of movies, short films, games, music, news and information, all viewed on a large personal seatback screen. There’s also a dedicated channel with kid- and family-friendly movies and television shows. World Cinema features programming with subtitles and language channels. Connect with in-flight W-Fi using Thai Sky Connect offered on its fleet of Airbus A350-900s and A380-800s and selected A330-330 flights.